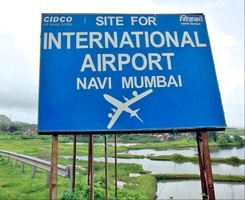 After the Civil Aviation Ministry recently approved the revised tender document for the proposed Navi Mumbai airport, the nodal implementing agency Cidco has extended the deadline to submit requests for qualification to September 2. Last week, a Cidco delegation had presented a revised tender document draft to aviation minister Ashok Gajpathy Raju, which he approved immediately. This is the second extension for the bids since June 18. "Bidders had requested us to make certain changes in the existing tender document. "Accordingly, we revised it and submitted it to the ministry for its approval, and was granted the same. "Bidders have now a month's more time till September 2 to submit RFQs based on the revised tender," City and Industrial Development Corporation vice-chairman and managing director Sanjay Bhatia, told PTI. The state-run agency had floated tenders for the over Rs 14,500-crore project in February and had fixed June 18 as the date of submission of RFQs. The deadline was, however, extended to July 30 as the bidders sought time to submit the tenders. In February round of RFQs, leading companies like Zurich Airport, Ferrovial Aeropuertos, Tata Realty & Infrastructure, Mumbai International Airport, Srei Infra Finance, Samsung-C&T, IL&FS, GMR Group, Essel Infraprojects, Gensler of US, UK Trade & Investment, and Vinci Concessions India among other had submitted their bids. But with the Tatas having two airlines, Tata Realty is not eligible for bids. "We have now extended the submission date to September 2. On receipt of the RFQs, we will finalise eligible candidates for the actual bidding for the project," Bhatia said. Only those who clear the RFQ stage will be allowed to bid in the request for proposal stage, he said, adding the Mumbai airport operator GVK has the first right of refusal in the project. Cidco was planning to start construction in 2010 and to commission the first phase of the project by September 2013. However, the project was stuck in clearance delays and land acquisition issues. The implementing agency has already initiated the process of acquiring the remaining 671 hectares, which it expects to be completed in the next six months. "We are receiving encouraging response from villagers and almost 90 per cent of villagers in the core airport area have extended their support for the project, paving way for acquisition of the remaining 671 hectares," Bhatia said. Altogether 1,600 hectares will be utilised for the airport and out of this 671 hectares are yet to be acquired. The project affected people from several villages had opposed land acquisition and also refused to accept the various compensation package offered by the state. However, after several months of hectic negotiations, PAPs finally agreed to the government's offer of 22.5 per cent of developed land for every hectare of land acquired by the state. As part of the package, they are also to be provided with one floor space index for 12.5 per cent of developed land and 2.5 FSI for another 10 per cent. Once fully operational, the proposed airport will have the capacity to handle 60 million passengers per annum. Maharashtra plans another city, 80 km off Mumbai!